Speaking at the Business Outlook conference last week in Grand Bahama, the Minister of State in the Ministry of Finance said that a new business development board would help to promote the island as a centre for investment. He also added that the group would help communication between the public and private sectors. The government has announced it will establish a new Grand Bahama business development board to drive investment to the island and promote its potential. Addressing the thirteenth annual Grand Bahama Business Outlook last week, Minister of State in the Ministry of Finance Zhivargo Laing said that the new board would be a partnership between the government, the Grand Bahama Port Authority (GBPA) and the Grand Bahama Chamber of Commerce. Lynden Pindling International Airport opens the new, $190-million, state-of-the-art US departure terminal in Nassau, as Phase I of entire airport-wide overhaul comes to a close. The launch comes in tandem with government approval for work to start on the next phases of the redevelopment, which looks to position The Bahamas' premier airport as the best in the region. The government will not stint in providing its citizens, residents and visitors with infrastructure and services befitting a 21st century Bahamas, with a world-class tourism product and international business centre, according to Prime Minister Hubert Ingraham. Ingraham made the remarks at the official opening of the Nassau Airport Development Company’s (NAD) new, $190.8-million US departure terminal at the Lynden Pindling International Airport (LPIA) last weekend. Despite rising operational costs, airline is set to increase its fleet as it expands the number of routes, with daily flights from Grand Bahama to Florida. Chairman says expansion comes on the back of a 51 per cent year-on-year increase in passenger airlift in 2010. Local airline and the winner of this year’s Cacique Award for Transportation, SkyBahamas Airlines Ltd, is looking to expand its fleet in tandem with the launch of a new route to Florida, according the airline’s chairman K Peter Turnquest. The new route from Freeport to Ft. Lauderdale and West Palm, Florida, is likely to run twice a day and will be introduced in Q2 this year, says Turnquest. Newly appointed president of COB, Dr Betsy Vogel Boze, envisions a multi-campus system, with research facilities and teaching centres. “We will work this year to distill our essence, to provide the best advice for our future direction and to define the standards by which we, and others, will measure our success,” she says. She’s been in office for only two months, yet Dr Betsy Vogel Boze, The College of The Bahamas’ (COB) fifth president, has already taken up the challenge and started displaying proven leadership and management skills–character traits the college listed as essential in its presidential search. After several delays and setbacks, all financing and contracts are in place to begin the mega-resort project on New Providence's Cable Beach. The brainchild of Bahamas resident Sarkis Izmirlian, the development is expected to take four years to complete and contribute approximately $1 billion in new spending to the local economy during the first year of operation. Pictured above from left to right: Dikran Izmirlian, Sarkis's father; Li Ruogo, chairman and president, Export-Import Bank of China; Sarkis Izmirlian, Baha Mar chairman and CEO; Brent Symonette, Deputy Prime Minister. Pictured below: at the left sit Sarkis Izmirlian and his wife, Katie. 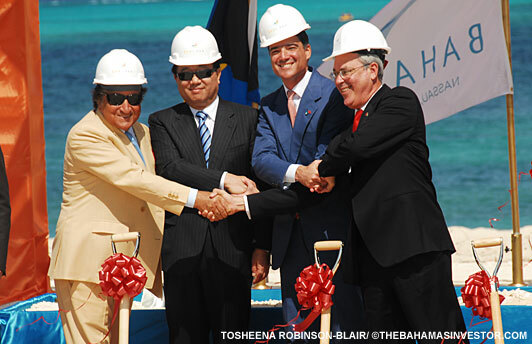 After years of negotiations, planning, setbacks and controversy, the multi-billion dollar Baha Mar resort on Cable Beach, New Providence, officially broke ground on Monday February 21. The project estimated to be worth $3.4 billion, is one of the largest private sector development projects ever to be carried out on Bahamian soil and is expected to be completed by 2014. The hotel resort complex will cover 1,000 acres and will house approximately 3,800 hotel rooms, a 100,000 sq ft casino, 18-hole Jack Nicklaus signature golf course, 60,000 sq ft retail village, and a 20-acre beach and pool “experience”. Top financial analysts debate the current geo-political climate in regards to investing and wealth management at an economic summit held in Atlantis Paradise Island. The three-day conference runs until February 19. Addressing the theme of “Crisis and Opportunity in the Global Economy” at the 2011 FreedomFest Economic Summit, a panel of top financial analysts and economists discussed the current geo-political climate in terms of investment and wealth management. Financial gurus, economic analysts, brokers and investors gather on Paradise Island this week to debate the world's economic outlook and investment climate. Renowned wealth and asset managers, and financial commentators, including Mark Skousen, Peter Schiff and Forbes columnist Ken Fisher, discuss the investment strategies in a new economic era. 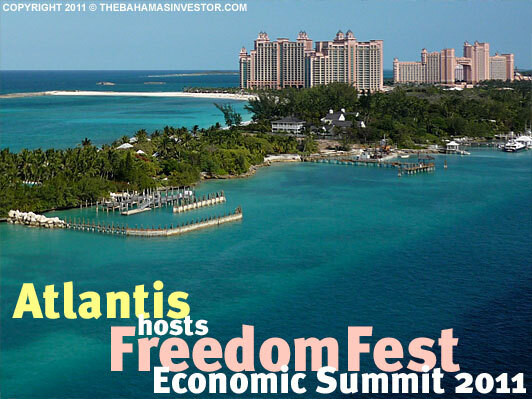 Established by financial economist Mark Skousen as an alternative to the Davos G20 economic summit, FreedomFest gathers together some of the top free market experts once a year to discuss economic trends and investment strategies. In his opening keynote address, Skousen spoke about forecasts and strategies for 2011 and how the financial crisis creates danger and opportunities in an investment portfolio. Specifically, the economist drew attention to growth in emerging markets, particularly China. Leading local lawyer urges the creation of a specialized legal system in regards to financial services, so as to remain ahead of the competition. Although local pool of legal talent is well developed, opportunities still lie in diversification and international exchange. The Bahamas could position itself as a leader in private wealth management by introducing a more specialized legal system, according to one of the country’s top lawyers. Heather Thompson, partner at Nassau law firm Higgs & Johnson, says there is a need for separate courts to handle cases concerning private wealth management and commercial law, as these would allow legal professionals to gain experience in the field. The Bahamas government signs a Tax Information Exchange Agreement (TIEA) with India in Nassau. This brings the total number of TIEAs signed to 24, the third with a major Asian economy, following agreements with China and Japan. At a ceremony in Nassau February 11, the government of The Bahamas and the government of India signed a Tax Information Exchange Agreement bringing the total number of such agreements held by The Bahamas to 24, ten of which are with G20 member nations. The Bahamas now has ten Tax Information Exchange Agreements (TIEAs) in force, with a further 13 that have been signed but not yet in effect. The information exchange treaties are part of government efforts to comply with international standards stipulated by the G20 and Organisation of Economic Co-operation and Development (OECD) member countries. Below is an update on the Tax Information Exchange Agreements (TIEAs) signed by The Bahamas, compiled by the Bahamas Financial Services Board (BFSB).